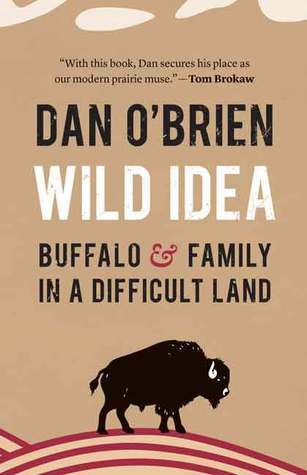 Wild Idea: Buffalo & Family in a Difficult Land. Dan O’Brien. Lincoln: University of Nebraska Press, 2014. Summary: Dan O’Brien continues the story begun in Buffalo for the Broken Heart, describing the growth of the Wild Idea Buffalo Company, the move to a new ranch, and the challenges of a maturing daughter, an aging friend, and the struggle to build an ethical and ecologically sound business on the ever-challenging Great Plains. In Buffalo for the Broken Heart (reviewed here), Dan O’Brien chronicles the challenges of cattle ranching on the Great Plains and his conversion to raising buffalo, which he argues are better adapted to the harsh environment, better for the grasses of the Great Plains, and better for people. That book ended with the beginnings of his relationship with Jill, and the launch of the Wild Idea Buffalo Company. This book develops the story from those beginnings. It interweaves the story of his partnership in love and business with Jill and the concerns many parents will identify with as Jill’s daughter Jillian comes of age, makes and later regrets some choices in love as she figures out her own life. Central to the story is the growth of Wild Idea. First they take on the challenge of purchasing a much bigger ranch (with much bigger debt) adjacent to federal lands where they can also graze buffalo, allowing them to acquire a much larger herd to meet the demand. This in turn requires the acquisition of a mobile slaughtering setup since on-site harvesting could sometimes be more than two hours distant from meat packing plants. A crucial turning point comes when a socially conscious investor who has purchased their products and loves what they stand for comes on board for a stake in the company. Suddenly the subsistence rancher and his wife, who was running the business side of Wild Idea out of a closet based on her restaurant experience, confront spreadsheets, production goals, and the need to further expand their business capacity–building a production and storage facility, hiring additional personnel, and finding sources of buffalo beyond their own ranch. O’Brien is honest about the struggle between his lofty goal of transforming ranching and the ecology of the Great Plains, and the realities of growing the business operation that must succeed with the workforce at hand in a difficult physical environment. “There was a tiny flicker of silver far above and the chuckle of flushing grouse below. It was all I could do to keep my eyes pointed upward. Another few flicks of light and the anchor shape consolidated, accelerated, and began twisting in freefall. The sizzle of wings came to my ears. Then Oscar was coming right at me and I heard the grouse whirr overhead. “There was a puff of feathers and Oscar shot skyward as the grouse tumbled to the ground. He reached his zenith and flipped to spin downward and settle on the grouse halfway between my position and where Erney sat in the ATV….Then I turned to call the dogs to me. They came at a sprint and we tumbled into the grass in a pile of laughter and wagging tails. This book seemed less evocative of the atmosphere of the Great Plains and the challenges of sustainable ranching than Buffalo for the Broken Heart. That book was more caught up with a vision, and this one with the nitty-gritty of turning that vision into reality. The circle of people closes in more around family and close friends–Gervase, Shane, and their investors. Yet what made this book stand out from just an article in Businessweek, was tough love and affection, between Dan and Jill, as parents for their daughter, and with their circle of friends, all trying to eke out a decent life on these Great Plains. And there is the almost mystical relationship with the buffalo for whom they care, and who care for them in turn, as Native American stories would say.